Miles was born in 1999. I remember feeling very lucky and deliriously happy. All that changed rapidly when I realised my baby had Down’s Syndrome. We stayed in hospital for one week because I was simply too scared to go home and was in shock. However, even though my grief was overwhelming, I felt a strong need to learn, to get involved and to do something positive. In 8 weeks, I had joined the Down’s Syndrome Association; two groups for families with children with additional needs; baby massage; swimming; and my NCT group coffee mornings. I went a bit mad! I had lots of new friends – some with babies and young children with additional needs, many of them with Down’s syndrome. My new friends were signing with their children and I realised I had to learn too. 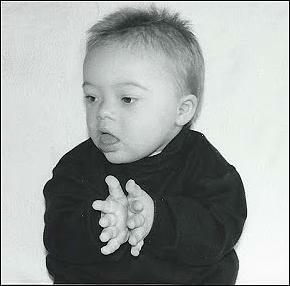 I had never heard of Makaton. I borrowed a video from the local toy library with Makaton signed nursery rhymes; it was presented by Dave Benson Phillips. Miles was now eight months’ old. We watched the video together every day with me rewinding, copying and putting the signs together slowly. I sang with Miles from a very early age, writing little songs about his toys, routines and daily activities. After a few days of watching “Dave” I nipped into the kitchen, leaving Miles in front of the TV. Miles usually cried when I left the room but this time he was quiet so I left him for a few minutes more. I thought he had fallen asleep. When I returned, Miles wasn’t asleep – quite the opposite – he was mesmerised by “Dave” and his waving hands! I knew this video was the only one of its kind, the only resource that was really going to help us. So with Miles in my arms, and tears in my eyes, I promised my baby boy that one day I was going to make him another one, I didn’t know how and I didn’t know when, but I was going to do it……and I did!! Miles was 22 months’ old when he signed his first word “more”. He now had a 6 month old brother Dominic, who started signing before his first birthday. Dominic was very vocal and Miles’s speech and language therapist commented regularly how Dominic’s communication was advanced for his age. In her opinion, it was due to him being raised in a signing environment. Soon I introduced Makaton symbols too, labelling our environment, doors, mirrors, windows, TV, toy boxes, the table and even the toilet! Miles has enriched and enlightened my life. Makaton signing has enabled us to communicate in a way that may not have been possible, empowering me and liberating him. Now Miles is a teenager with a dual-diagnosis of DS/ASD, we still use signs daily, he also uses some speech and we use Makaton symbols and MyChoicePad to help with his daily routines and activities. Signing is a life-long journey for us and I cannot imagine our lives without it.